Relax and enjoy our conveniently located town house. We are: 1 mile to the Down Town Mall, 2 miles to the UVA Hospital, 3 miles to Scott Stadium, 3 miles to Thomas Jefferson's Monticello and easily accessible to many wonderful vineyards. It is easily reached by exiting Interstate 64 onto Monticello Avenue and coming into town to Druid Avenue. The town house is comfortably furnished and has 2 good sized bedrooms 4 full bathrooms, a quiet den, a living room/dining room with flat screen TV, a complete kitchen, a rec room and a garage all for you to enjoy. Because it is an end unit the town house has lots of natural light with mountain views. The well outfitted kitchen has granite counters with stainless steel appliances and there is a washer / dryer in it's own space off of the main hallway. Our family has owned vacation rentals for over ten years and we have stayed in many, many short term rentals on vacation and on business, so we have tried very hard to make this a great place to stay while you enjoy Charlottesville and all that this area has to offer. Please feel free to contact us with any questions that you may have! Bob's cell phone is 703-434-2850. We have used vacation rental properties throughout the US and in a number of other countries, and really think it is the best way to travel. We have operated vacation rental properties for over 12 years and have tried to make each one the kind of comfortable and convenient place that we would choose to stay. Great location, plenty of space and privacy when you want it. Garage parking and one reserved space for unit Z as well as lots of street parking. Antique walnut table with leaf stored in the den closet. We had an excellent stay at this home. 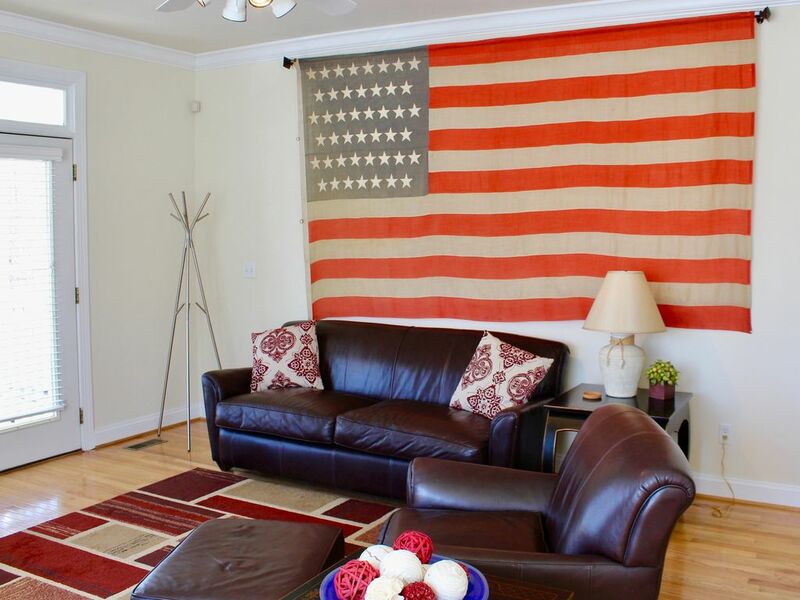 Well furnished, clean and so close to Downtown and the Cville fun. Easy parking and nice to have a garage to unload as it was pouring when we got there. Great for families as there are 4 full bathrooms! Lovely porch which we will enjoy next time! We 've spent our vacation in this luxurious townhouse - everything was perfect: we found the house clean, bright, cozy and warm. We had a great time around the table eating well and catching up with each other life. The house is close to every attraction in town and elsewhere. Thank you for such a great time! This was my family’s second time staying at this townhouse and it did not disappoint!!! Great get-away house; it met all our needs! The house was well-stocked with all sorts of kitchen utensils and appliances. Plenty of lighting in each room. Living room, dining room, deck and kitchen were very inviting for relaxing, food prep and we could all be together in the same place. Would like one more easy chair in the living room. All bathrooms were modern, comfortable, plenty of hot water. The two upstairs bedrooms were extremely comfortable. Great mattresses and pillows and quilts. However the sleep sofa in the "Blue Room" definitely needs a new mattress. The springs are poking through. We had to take two blankets and fold them to act as a mattress. Keys and garage door opener were easy to find and use. We were 1 mile from historic downtown Cville...so convenient. Everything was quite perfect. And thank you for seeing to it that we had perfect weather, as well! It was truly home-away-from-home. We had a great time and had everything we needed. Townhouse was very clean & comfortable. Only issue was the coffee pot had moldy grounds in it. As is true with any townhouse if you have an issue with steps this is not for you. The depth of the stair treads is particularly short. There is an abandoned house next door that gave us pause when we first got there. Because the street is fairly busy we felt better. The unit would benefit have new towels.